Preview: A review of the new book The Franciscan Saints with ideas for using it in the classroom with children. I love teaching about and learning about the Catholic Saints. They are our friends in Heaven, our MVPs, our Hall of Famers. They are teaching us how to live holy lives as we follow their examples. I'm always excited to find a new saint book to add to our collection. While we have several favorite saints books for children, we have less books that are written for adults. I was excited to hear about The Franciscan Saints by Robert Ellsberg and get the chance to read and review it. I used it to help me research some saints that I used in my products and in my classroom at church. I also found out about saints I had never heard of who followed the ways of St. Francis. Having visited Assisi 11+ years ago with my family, Francis and Clare have always held a special place in my heart so it was great to learn about others who followed in their footsteps. The Franciscan Saints by Robert Ellsberg starts with an introduction to Franciscan saints and the example Pope Francis is currently setting for the world as he follows in the ways of St. Francis. Robert Ellsberg then gives an overview of the over 100 saints that he has included stating that they are from all walks of life, yet they share a family resemblance. "Among the notable features: evangelical zeal, humility and simplicity of life, closeness to the poor, a spirit of prayer, and a certain freedom from the cares of a world preoccupied with greatness, power, and grandiose ambitions." He then goes on to introduce the saints to us starting with St. Francis and St. Clare. Each saint has a page or two devoted to a brief biography of his/her life and ends with a short quote by or about that saint. I recognized several saints that I have researched in the past to add to my Catholic Saints products. I also used the book to help me research some new ones that I've just added. Those familiar names included St. Francis of Assisi, St. Clare, St. Anthony of Padua, St. Elizabeth of Hungary, St. Thomas More and St. Maximilian Kolbe. I really liked that this book included lesser known saints. There were so many names in there that I had never heard of which makes this a fantastic resource for learning about new (to us) saints. I also appreciated that Blessed Solanus Casey was included. We are going to his Beatification mass in a few weeks in Detroit and I am excited to apart of something like this, especially a soon to be saint that came from the area where I live. My grandparents even took my aunt to Father Solanus Casey when she was battling (and unfortunately dying from) childhood cancer. 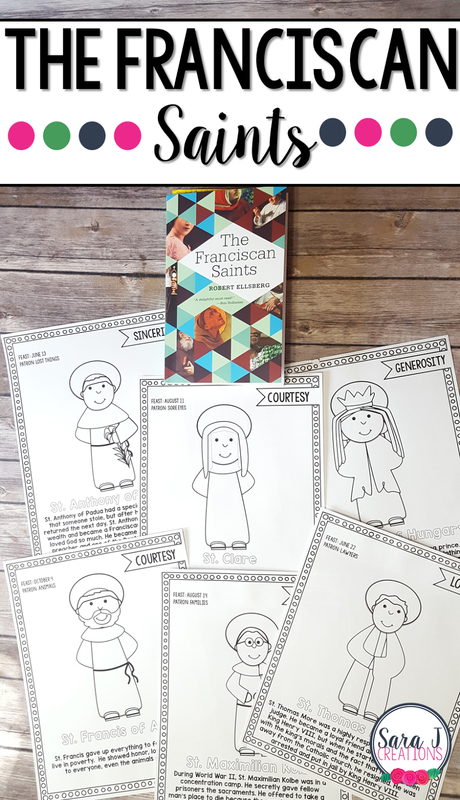 While this book isn't specifically written for children, it could definitely still be used in the classroom to teach about some of the included saints, especially the lesser known ones. Here are some ideas for using this book in the classroom.